Does your home have an electric heating system? Have you ever wondered if there’s another, possibly better, way to heat your home? There is. It’s called propane, and it has many advantages over electric heat. Switching is easy. It only requires a new furnace and propane tank installation in Reidsville, NC. If your furnace is getting old or requires frequent repairs, now is the time to consider switching to propane. Efficiency. Propane is a high-efficiency heating fuel. Less propane is required to heat your home than electricity. Affordability. Propane is an affordable source of energy for home heating when compared to electricity, heating oil, and natural gas. Versatility. In addition to heating your home, propane can be used for appliances like stoves, ovens, clothes dryers, and water heaters. Safety. Propane is a non-toxic, non-poisonous gas that has a very low volatility (requires extremely high temperatures to ignite). Reliability. When the power goes out you will still have heat if you have a propane fireplace. Your electric furnace wouldn’t be much help in a severe snow storm if trees fall on power lines and cause outages. Environmentally friendly. Propane is not itself a greenhouse gas and is a low-carbon, clean-burning fuel. It does not harm the earth or ground water if a tank leaks. Convinced you’re ready to make the switch? Follow these steps to switch your electric heat over to propane as easily as possible. Call your HVAC company (Carolina Fuels). Your heating and air conditioning company can help you get started on your conversion. A technician can evaluate your system and determine the best course of action for switching. Schedule propane tank installation in Reidsville, NC. Your propane supplier will need to install a propane tank on your property. Your tank can be buried underground if you would prefer to conceal it and save space. Have a propane furnace installed. Your HVAC technician can recommend a new propane furnace for your home. If your electric heat was a forced air system you will already have ductwork in place, which would lower your installation cost. Convert other appliances or purchase new. Any appliance you wish to run on propane will either have to be converted if possible or replaced. If you’re ready to save money and enjoy the other benefits of heating with propane, contact Carolina Fuels. Propane tank installation in Reidsville, NC, and furnace installation can be handled by one company this fall before the weather gets cold. Be prepared for winter like never before and plan to spend less on heating your home this year and in the years to come. 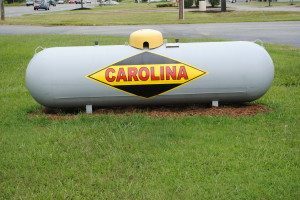 Carolina Fuels offers free tank swap outs for new customers as well as other propane specials and discounts. Call (336) 623-9741 today and see how easy it is to switch.